​This is our 5th year visiting Cedar Key and although it feels like home to me, that's five years I haven't spent Christmas with my immediate family. 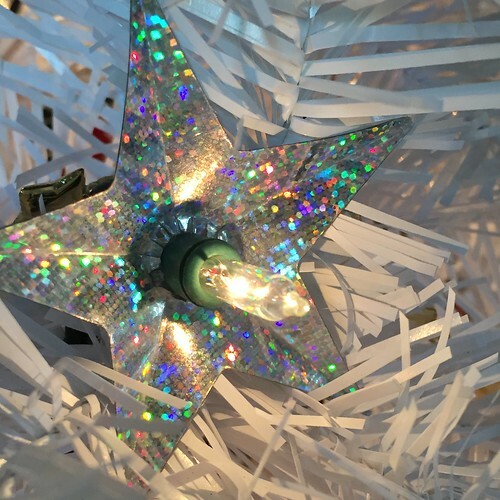 This year it caught up to me — I have nostalgia and I want "Christmas." This may be unknown to you, but it certainly isn't a secret, my husband — whom I love dearly — is a scrooge. I don't mean just a "bah humbug" kind of scrooge, but a if-I-could-I-would-CANCEL-Christmas scrooge! Remembering my awful allergy breakout the last time I decorated a Christmas tree, I went artificial. 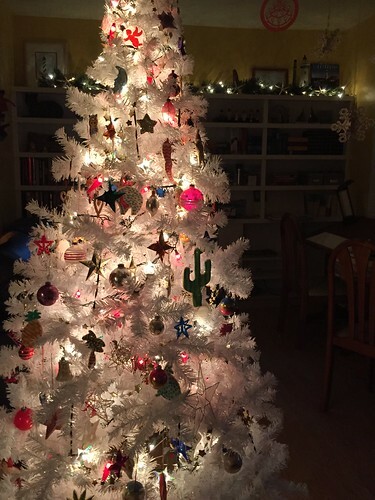 Being a Northern gal, green seems out of place next to Palm Trees and Cabbage Palms, not snow, so I chose an artificial white tree. That says "Florida" to me for some inexplicable reason, meaning feeling. A slight oversight, all my Christmas lights are green (to go on a green Northern tree). Next year I will perhaps invest in some lights with white cords. It's not the same, sitting by the lit up Christmas tree in a rental with your door open because the temperatures are mild, but there is still that magic in gazing upon the tree. There's still that magic in decorating the tree of which I did alone because as aforementioned my husband is afflicted with scrooge syndrome. I did subject him to hours and hours of Christmas carol therapy and I think it might have helped just a little. As is my tradition, and I believe my grandmother the one and only Violet Fern also partook, one must decorate the tree with a bit of spiked nog. What's that you say? Vegans, or plant based weirdo diet people, do not consume dairy nor eggs — which astonishly to some are a main ingredient in egg nog, or perhaps it's the revelation that the eggs are raw that is astonishing if you were to make your own. No matter! 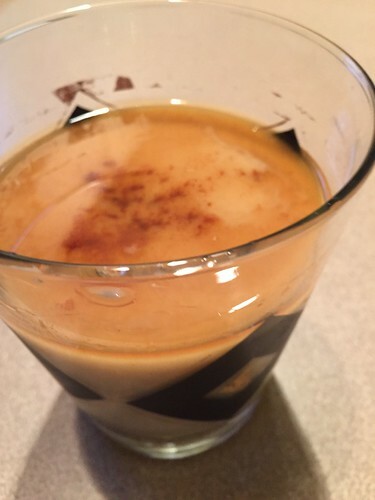 There are now dairy-free, egg-free nogs on the market and they are just as delicious especially with my favorite spike of Kraken and a bit of sprinkled cinnamon and nutmeg. 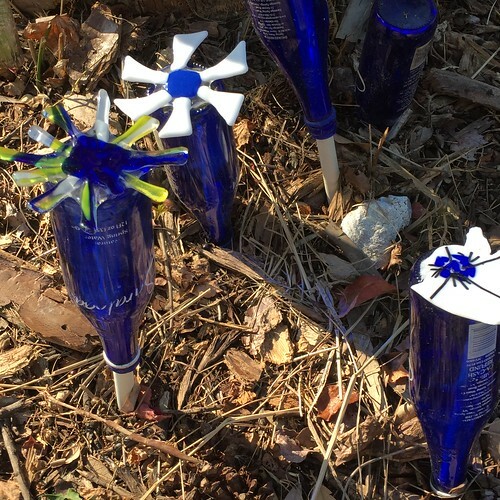 Some traditions can be carried on with slight modifications. 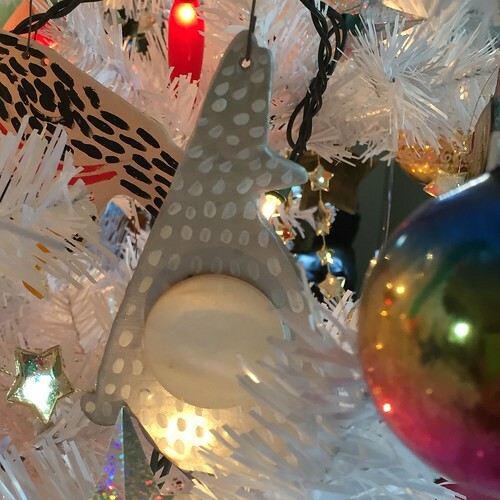 One of the expected joys in decorating my Christmas tree this year was unwrapping (inanimate) ornaments, each of which sparked (alive) memories of who gifted onto me or their origins. As I mentioned in a previous post, I did make some cookie dough ornaments with the fond memory of making sugar cookies decorated with colored egg washes with my mother and family. I brought some of those with me. I have missed hanging up ornaments given to me by my grandmothers and great aunt. These are little treasures to me and remind me of the 1950s era (even if I wasn't born until the next decade) and of Christmas Eves past spent in my grandmother's basement complete with pool table and bar or my other grandmother's living room. All fond memories of Christmas cheer. What's a little bit synchromatic is that the glasses here in our winter rental, as pictured in the nog shot above, also remind me of my Grandmother's basement bar and that 1950s era. Some of my favorite ornaments given to me by my Grandmother and Great Aunt. 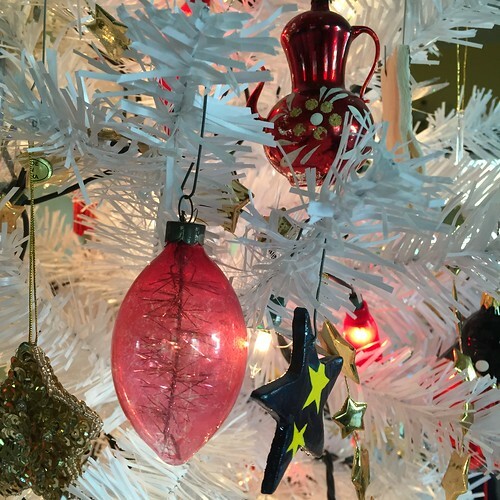 ​I love the tinsel nestled inside the pink glass tear drop shape, and the tea kettle — so delicate! 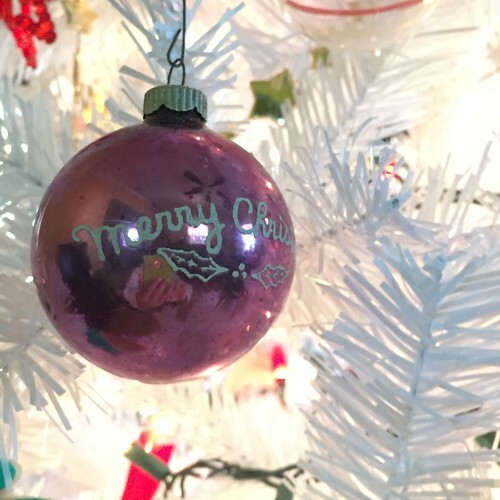 ​Merry Christmas always reminded me of Florida! I feel its at home this year. 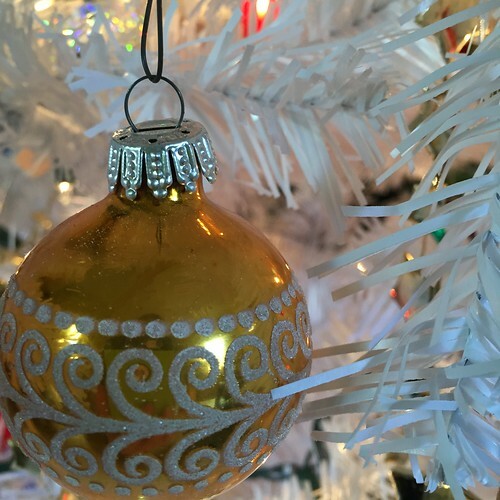 My other Grandmother kept things simple with only an array of gold ornaments like this. 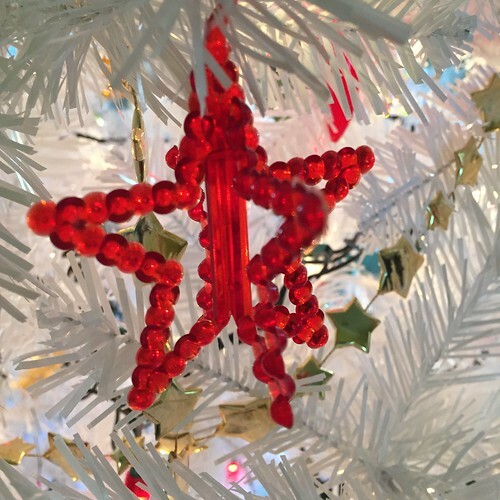 What spurred this post was actually a comment I made on another blog that encouraged its readers to share their Christmas traditions. That long winded answer/comment told me to write it out in a post of my own. And I encourage you to share your traditions or a favorite tradition here in the spirit of Christmas. 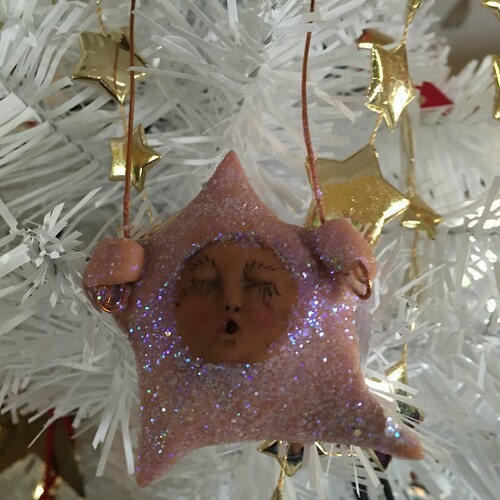 I have collected "star" ornaments for years but this star also belonged to my grandmother. ​It slides apart to store. 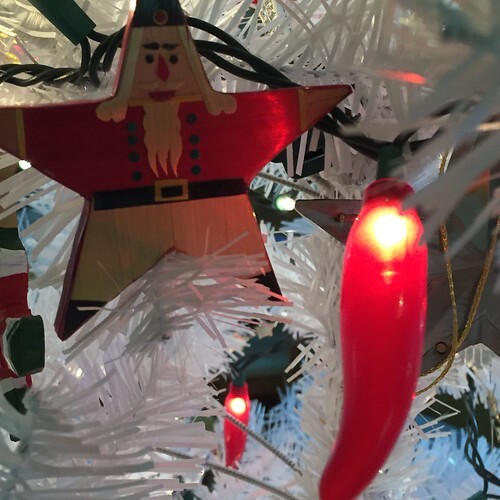 ​I'll try to sum up my immediate family's traditions here — the ones I am pining for. I wish I could go to my Mom's for Christmas Eve — wish I would have planned ahead to fly up to Syracuse and pop in for a surprise Christmas! — spend the night and then go to my brother's (close by) for Christmas Day brunch. Christmas Eve is all about family — exchanging gifts from family to family including family pets. (When we were kids, Christmas Day morning gifts were from Santa.) Christmas Eve gift exchange includes gifts with an abhorrent amount of tape so that opening the gift without some sort of tool is nearly impossible. It also includes girl gifts from Mom, i.e. kitchen gadget, and boy gifts from Dad, i.e. power tool. It might also include a candy cane inside the gift box — something my Grandmother would do when she mailed gifts to us. The comment "oh, this bow is like one of Grandma's!" may be exclaimed meaning it was tied around the gift very, very tightly. I included candy canes in my gifts this year that have been mailed to my Mom's. I will also say I used almost an entire roll of packing tape on one of the boxes I mailed, mostly to hold it together, but I can't help thinking about the tape tradition. Tee hee. dear friend. I have made my wish. only from craft clay, and handpainted. I lived alone in an apartment at this time of my life. ​ is a big, white, glossy button. ​In place of dinner on Christmas Eve is an excessive array of appetizers/cookies that we munch on throughout the night while drinking spiked egg nog, wine, and mixed drinks with Christmas carols playing in the background. We used to follow that up with midnight mass but that has morphed into 5 O'clock mass so we can drink responsibly. Back to that array of snacks: homemade fudge from Grandma (now made by Mom) and/or the seasons' Christmas cookies, homebaked rolls (family recipe baked by Dad) with egg, tuna and ham salad filling, and pickled herring are staples — quite a combination! Breakfast brunch at my brother's includes more homemade rolls, kuchen (coffee cake - the same dough as the rolls with a crumbled sugar topping), and "potato sausage" made by my father — recipes carried down from generations on my father's side. I have "veganized" grandmother's roll recipe as my husband, brother in law and sister now all eat plant based diets. The "potato sausage" is a little bit more difficult as its secret ingredient, aside from shredded potatoes, is leaf lard. My dad bakes all the rolls and kuchens now with the help of my nieces carrying on tradition. My Mom gave me these slip on stars to make your Christmas lights sparkle. I believe they were from Avon, now a collectors item? I also have these hot chili pepper lights that seem closer to home here. This Christmas we will once again be headed to Gulfport. Gulfport is where my husband's parents lived. It is good that we have spent the last couple of Christmases in Gulfport because both of my husband's parents have now passed on. Last year spent there because it was the first (and unbeknownst to us at the time, the last) Christmas his Mom would spend as a widow. The year before because of his Dad's health. Prior to that because we mostly spent Christmas with my folks when we stayed up North and his folks were in Florida. So that switched around finding ourselves in Florida, too. This year we are going to sort through their condo along with his sister and brother-in-law to put it up for sale. And although that may sound dire, it's a mixed bag because my husband and I now have a Florida home to furnish come the New Year. That is my secret, a home here in Cedar Key of our own! We will, be assured, still be returning North come April. Our Florida home will be rented out when we aren't here. It is simply a stepping stone to a very long range, far in the future plan of sorts. So this Christmas is the ultimate of where the ghosts of the past meet the ghosts of the future. I am always an advocate of change. Change is good, it's evolution. Sometimes it is forced upon us but I am a firm believer that things always turn out for the best. So, though I am pining for traditions past, sometimes even to the point of tears (in paradise — do not feel the least bit sorry for me who is blessed to the nth degree), I know that Christmas will evolve for my, our, family and we will spend it together once again somehow in some way that will make more precious memories, new traditions that we will all come to love. I wish all of you a very Merry Christmas, holiday — however you celebrate, and please share — much peace and joy, and the spirit of the season. After a few days rambling we finally arrived at our winter destination in one of my most favorite places, Cedar Key, FL. We made a few stops along the way — Asheville NC, St. Simon's Island GA (we enjoyed and will probably stop there again on our travels back and forth), and St. Augustine FL. We actually left St. Augustine a day early. It was really nice there and seeped in history but it was too "city" for us. Too many tourist attractions, busy traffic ... just not our thing although I would still recommend a visit to our oldest city in this nation. The old town part of St. Augustine is very fun but be warned, parking is limited. We just couldn't wait to get to small town, old Florida, peaceful Cedar Key and so we left a day early. Cedar Key is not for everyone either. It is rumoured that once you cross over the No. 4 bridge you are either "welcomed home" or are "looking for more." I was immediately "welcomed home." There isn't a whole lot to do here. There isn't shopping unless you count the one souvenir store, two art galleries (one of which I hope to join next year), the new and very attractive Bonish Studio, and the small grocery store. There aren't many restaurants and bars either, zero clubs, and most tend to open and close on a whim. Nightlife tends to end at 9pm. There IS the very ambient sunset tiki bar. There IS a fantastic new coffee shop called 1842 Daily Grind & Mercantile where I will be undergoing coffee therapy. There isn't a huge beach with parasailing rentals, jetskis, etc. but you CAN kayak all over the islands many of which are wild, which is what I love. Kayaking depends heavily on the tide. There IS a whole lot of bird watching. There IS a whole lot of clam farming. We stopped in Gainesville to stock up on groceries not that the little store here is not well equipped. Just that we both eat a plant based diet and well, hey, not every place sells tofu and nutritional yeast. Gainesville has it all — Trader Joe's, Publix, Earth Fare. All beautiful stores that carry things we have grown accustomed to. And best of all I can buy wine in the grocery store again! We stopped at a storage unit we rent to supplement our rental home with things like nice pots and pans, sharp knives, linens we prefer, bikes, my painting table that my grandfather built, beach chairs, etc. I have set up my little painting area and my husband has set up his little office and we are finally settling in and getting at it a week after our arrival. I decorated for Christmas this year — actually carting down some of my Christmas decor rather than leaving it sit on the shelf at home. I orderd a fake tree considering my allergy breakout the last time we put up a live tree. I ordered a white one off of Amazon — I figured if it's fake, I might as well go all the way and white would look good in a tropical atmosphere. I am hoping it arrives today but the day is waning so maybe tomorrow. What you see on my painting table above are my Christmas designs which are a little different this year. I wanted something spontaneous, fun and beachy if not cheeky. I used oil pastels — my second favorite medium to watercolor. I am having them printed as postcards for mailing. I created 6 different designs. If you know me, and sent me a card here last year so I have your address, there's a good chance one of these will show up in your mail box. 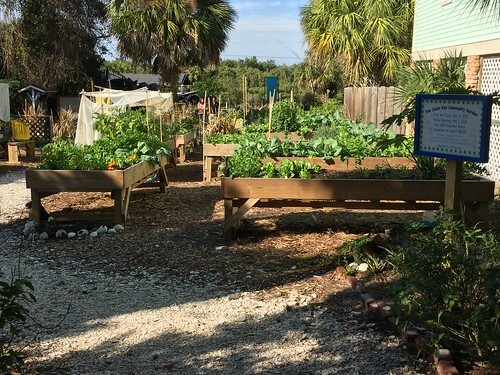 Another added venture this year is that we have a half plot in the Cedar Key Community Garden! 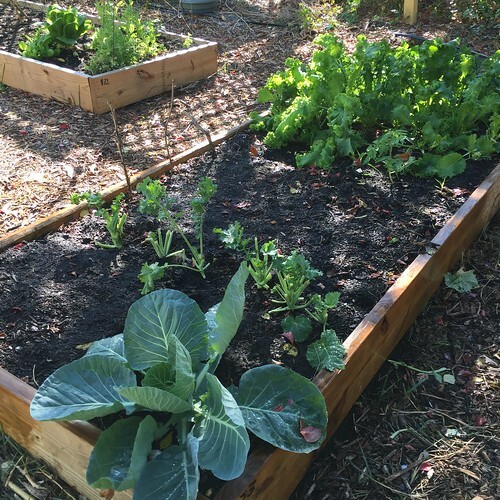 It is the best community garden I have ever encountered and I planted my little half plot up today. You can leave the garden at home but you can't leave the gardener! Plots are at waist height or ground level. I took a ground level because I'm able and that is what was available. 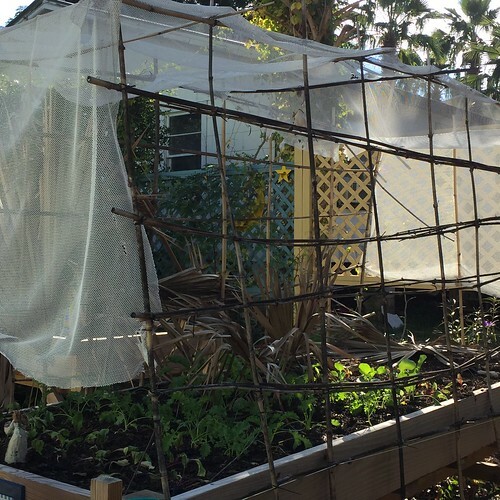 I joined because I feel the way to learn about gardening in another climate (a dreamy zone 9!) is to jump right in. This time of year I can plant cold crops so I planted peas, spinach, kale (Lacinato), chard, lettuce and watercress. I added a few calendula seeds in there, too, for color. They seem to sprout quite early in the spring up North and bloom into frost so we'll see. I was generously given a few plants alreadly growing so I have a good head of cabbage going and some curly kale. 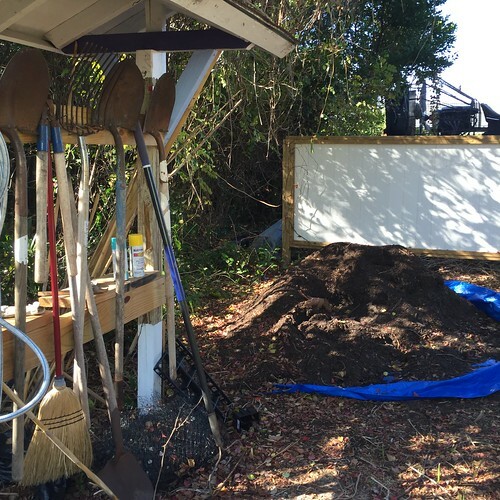 I only brought two tools with me — my good pruners and my beloved hori hori knife — but the community garden has tools for everyone to use as well as a nice stockpile of compost. Water is also very convenient. It's surprising to be sowing seed in December with butterflies fluttering about but a girl can get used to it quick! 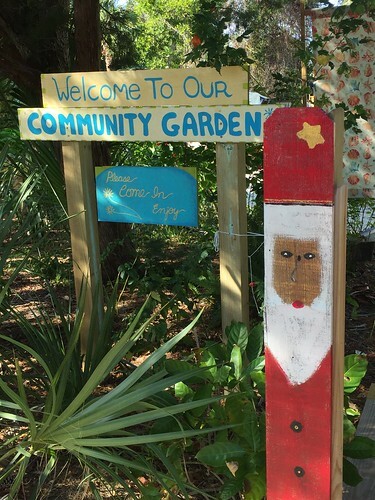 Cedar Key is a kitschy, artsy community and that personality shows up in the community garden, too. Just look at these beautiful floral arrangements! So, already I have learned my zone, that this is considered "Northern Florida" in general, that shade is almost as important as sun here. Planting seed I do not have to worry about shade but if I were to transplant some little babies, they would need shade until they began growing. 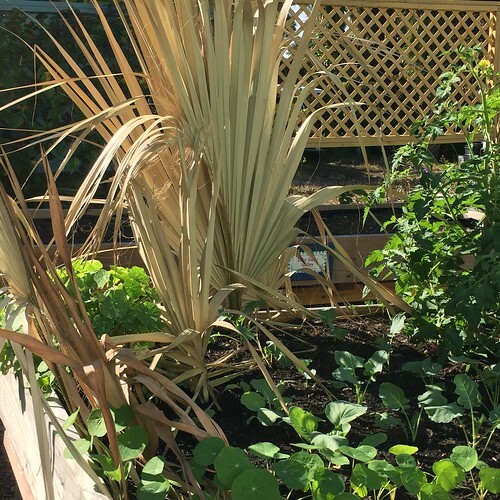 Gardeners here are very resourceful and use shedded Palm fronds for shade, netting, and bamboo stakes. I can't help myself — I am researching Florida plants. I have another entire world to get to know. I stupidly left my Florida plant books at home — I always forget something! But google is a vast world. 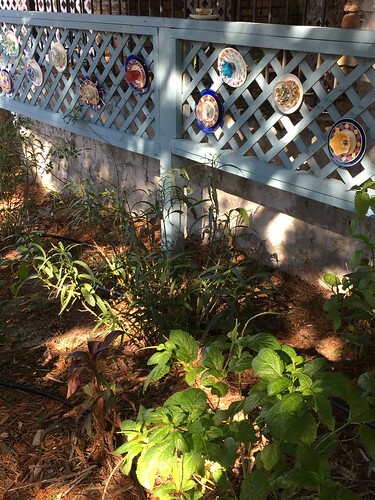 I would plan a Florida garden much like the Violet Fern Garden — using a structure of native plants at all levels that are bee and bird friendly, and filling in with a few "can't resist" plants always making certain that they are not invasive. Someday I hope to have a garden here as well and that day maybe be arriving sooner than I thought!